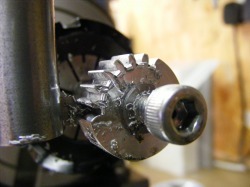 More recently, John Stevenson has suggested an alternative method of making gear cutters (http://bbs.homeshopmachinist.net/showthread.php?t=42051) which is much simpler. 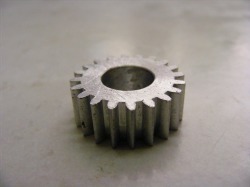 In this method the gear cutter is formed directly using a tapered milling cutter to cut the shape. Doing this automatically forms the relief on the cutter. 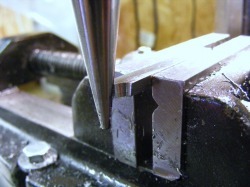 The main disadvantage of this method is that the tapered milling cutters are quite expensive and several would be needed to make a set of gear cutters. John Stevenson has also published (http://metalwebnews.com/howto/gear/gear1.html) a table for the diameters, spacings and infeeds for the button method. His numbers do not agree with those given by Ivan Law. My own calculations agree with John Stevenson's. 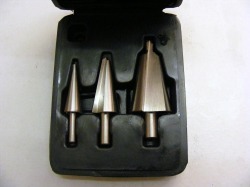 It occured to me that cone drills are readily available (see for example www.screwfix.com order number 45562) and that these might do the the same job as the tapered milling cutter. The advantage of using these is that a set covering the range 3 mm to 30 mm costs only circa £22. This is the set of cone drills I purchased from Screwfix. It is nicely presented and well finished. The drills have very sharp cutting edges. Each drill has two flutes. The total taper angle is 20 degrees giving a half angle of 10 degrees. The cone drill is being used to cut the profile of the gear cutter in a piece of 3 x 6 x 50 mm gauge plate. 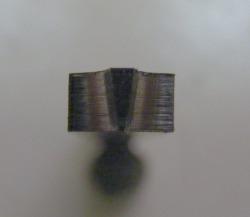 This shows the cutter after profiling with the cone drill. This is the end profile of the cutter. Note the relief angles on all the cut surfaces. 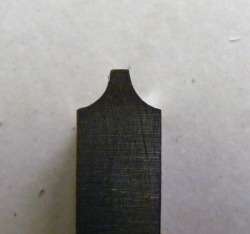 The header photo shows the cutter after reducing the length to 25 mm followed by hardening and tempering to light straw at the tip. 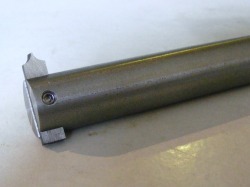 The cutter is mounted in the end of a piece of 16 mm steel bar. It is held in place by a single clamp screw. 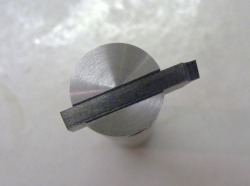 The end view of the cutter mounted in the bar shows that the cutting face is on a diametral line though the centre of the bar.